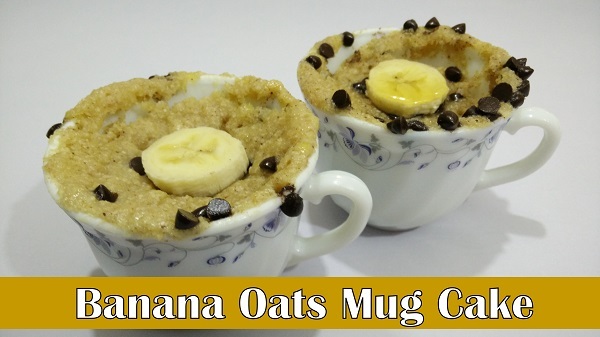 Banana Oats Mug Cake is very easy and instant cake recipe without flour. I like to refer to this Eggless mug cake as “breakfast” as it combines two of my favourite breakfast items, Oats and Banana. This soft and fluffy banana bread mug cake requires only 5 minutes to make. Take ½ mashed Banana in a bowl. Add Honey, Butter, Vanilla Essence and mix well. Add Oats Flour, Baking Powder, Salt, Cinnamon Powder and mix well. Shift the Batter in microwave-safe Mug and add Choco Chips. Bake in the microwave for 1 & ½ minute. Garnish with Banana slice and Honey.